The use of TCP also has an interesting impact on the way BGP messages are structured. One thing that stands out when you look at the BGP message format (as we will see shortly) is that a BGP message can have an odd number of bytes. Most routing protocols are sized in units of 4 or 8 bytes, but since TCP sends data as a stream of octets there is no need for BGP messages to break on a 32-bit or 64-bit boundary. The other impact is the need of a special Marker field to help ensure that BGP messages can be differentiated from each other in the TCP stream (more about this in a moment). Like most messaging protocols, BGP uses a common message format for each of its four message types. Each BGP message is conceptually divided into a header and a body (called the data portion in the BGP standard). The header has three fields and is fixed in length at 19 bytes. The body is variable in length, and in fact is omitted entirely in Keepalive messages, since it is not needed for them. The general format for all BGP message types is shown in Table 136 and Figure 192. Marker: This large field at the start of each BGP message is used for synchronization and authentication. 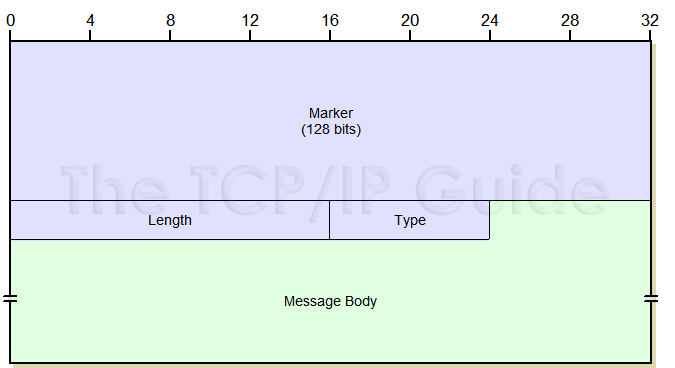 Length: The total length of the message in bytes, including the fields of the header. The minimum value of this field is 19 for a Keepalive message; it may be as high as 4,096. Message Body / Data Portion: Contains the specific fields used to implement each message type, for Open, Update and Notification messages.